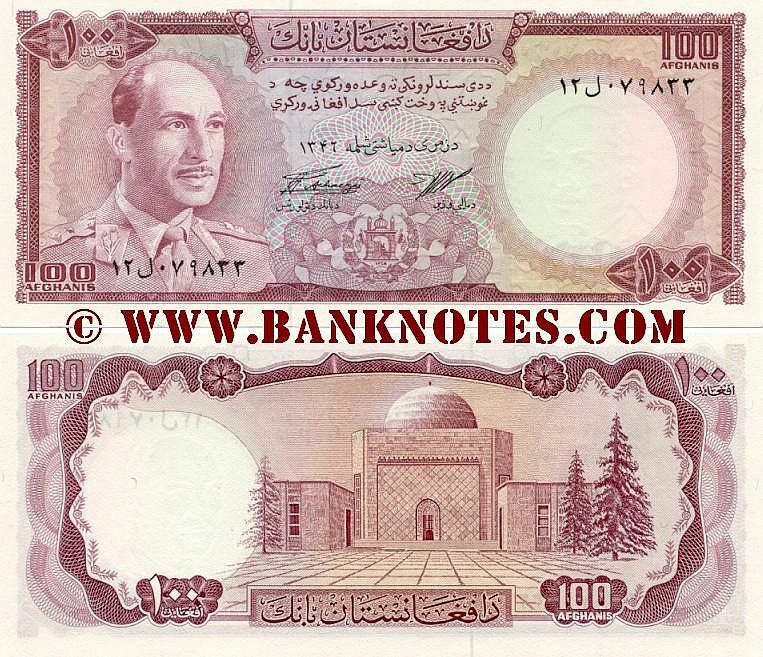 Afghanistan 100 Afghanis SH1346 - 1967 - Afghani Currency Bank Notes, Asian Paper Money, Banknotes, Banknote, Bank-Notes, Coins & Currency. Currency Collector. Pictures of Money, Photos of Bank Notes, Currency Images, Currencies of the World . Front: The last King of Afghanistan (1933 - 1973), Mohammed Zahir Shah (1914 - 2007), in military uniform. Coat of arms. Back: Mausoleum of King Nadir Shah Ghazi (1883 - 1933) in Kabul, Afghanistan. Watermark: Effigy of Mohammed Zahir Shah. Khan Ziyai (left to right). Issuer: Bank of Afghanistan. Date of Issue: 1967. Legal tender: No. Material: 100% cotton. Printer: Thomas De La Rue & Co. Ltd.
Texts: Da Afghanistan Bank. One Hundred Afghanis.